The Department of Missions expresses through giving the congregation's love for God and His creation. The goal is to expand the congregation's awareness of the mission of the Christian Church. The Department of Missions informs the congregation of local, national, and worldwide mission needs, and provide the congregation with opportunities to support missions through prayer, offerings, and personal service. The Missions Department carefully considers supporting missions both locally and globally. We sometimes meet in person and sometimes have email meetings to make our monthly selections of how your missions dollars will be allocated. In the 2016-17 fiscal year from July 1 to June 30 missions funding went in many directions, some staying within our local area, some going to far away places. A little more than a third of our funding goes to missions of the Evangelical Covenant Church with strong funding for Covenant Point and Covenant World Relief. We know that those dollars are well spent. We contribute slightly less than that to local organizations that serve our local communities, and slightly less than that goes to other global organizations that we have researched and found to be aligned with our giving criteria. We take the trust that you place in us very seriously and are truly grateful for the dollars that you contribute. The Community Church of Boulder junction has supported the Covenant World Relief fund generously over a number of years. An offering is received at Thanksgiving time, supported in large part by "soup can banks". A lid and label is available at the church whereby you can make your bank from an ordinary soup can for your home/family use. Some people empty their change into the bank at the end of each day. Some put a designated amount in each day. Some feed the bank at each meal. Whatever means people use to collect their offering, all is appreciated and well-used. World Relief funds are used to bring assistance to areas in the U.S. and around the world at times of tonrnadoes, earthquakes, severe drought, tsunamis, famine, etc. The funds are also used for communitty development projects, such as clean water and sanitation, micro-financing start-up businesses, medical care, women's empowerment, building of schools, etc. Checks should be made payable to our church with CWR on the memo line. Jim Peterson served our congregation early in his ministry as an intern pastor. They are currently serving in Japan. 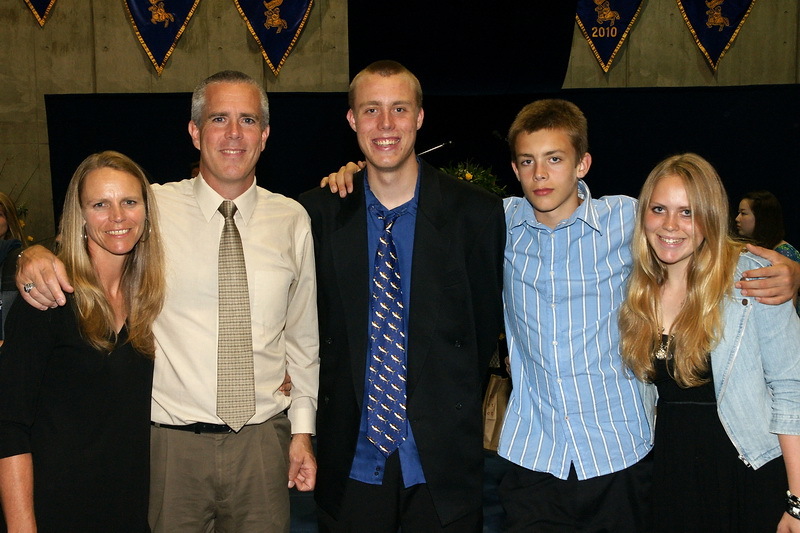 Here is a photo of Jim, his wife Hydi and their three children.